Group B in the Eurocup is the one group where places in the Top 16 are still up for grabs which means that we could be in for quite a night on Wednesday evening. The hosts in this game are one of the two teams who are already assured of their place in the next round so they may not have as much to play for but this is a massive game for Bilbao. The hosts have played well this season and can be proud of their unbeaten record at home to this stage of the season so far. With this in mind they will be keen to avoid defeat on Wednesday to take that record to the end of the regular season. There is also the fact that the Moscow side tasted victory in Bilbao when these two sides clashed earlier in the campaign. That 72-91 result will give the hosts further confidence going into this game. Jacob Pullen has been a key player for the hosts this season with an average of 13.4 points per game. He has been backed by Sergey Monia who has provided an average of 13 points per game. Bilbao know that if they win, they are in the Top 16 and the other game of Group B on Wednesday night will see the loser heading out of the tournament. If Bilbao lose this game they will be praying that Rytas get the victory in their match as that would see Bilbao advance instead of Fuenlabrada. Scott Bamforth has provided an average of 13.3 points per game, Ivan Buva has offered up an average of 12.3 points game and Alex Mumbru has notched an average of 11.1 points per game. 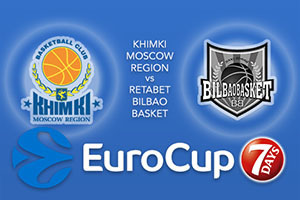 There is something at stake in this game for the side from Bilbao and they could have all the incentive they need to push on while in Moscow. The hosts will want to maintain that unbeaten record so take Khimki Moscow Region at -6.5 which is on offer at odds of 1.90. Anyone looking for the Over/Under market should go UNDER 166.5 at odds of 1.90. Bet Now!